This is High Quality Case/International Harvester Clutch Kit 360488R92, 360746R1WorK With the Following Tractor Models Case/International Harvester – 2504 Indust/Const, 2544 Indust/Const, 300, 330, 340, 350, 3616 Indust/Const, 460, 544, 606Technical Details If Available ;10 1/2 Inch Clutch kit containing- 1-10 1/2 Inch IPTO Pressure Plate with 1 11/16 inch 16 Spline hub (360746R1), 1-10 1/2 Inch Clutch Disc with 1 1/8 Inch 10 Spline hub(360488R92), 1-Release bearing (158125C91) and 1-Pilot Bearing (ST544). 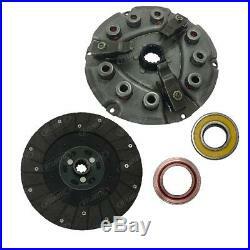 The item “Case/International Harvester Clutch Kit 360488R92 360746R1″ is in sale since Thursday, August 16, 2018. This item is in the category “Business & Industrial\Heavy Equipment, Parts & Attachments\Heavy Equipment Parts & Accessories\Tractor Parts”. The seller is “gilpartsshop” and is located in US. This item can be shipped to United States, Canada. This entry was posted in caseinternational and tagged 360488r92, 360746r1, caseinternational, clutch, harvester. Bookmark the permalink.